Gaming-oriented smartphones have become very popular in the past few years. Asus brought its ROG (Republic of Gamers) brand into the smartphone industry, Razer bought an OEM called Nextbit and release the Razer Phone, Nubia released the Red Magic, Xiaomi released the Black Shark, and so on. Even if some phones don’t include the ‘gaming’ branding in their name, all the recent flagships are perfectly capable of playing graphics-intensive titles, thanks to the ever-so-advancing system-on-chips and graphics processing units. By default, Android doesn’t include a lot of game optimization features to make the playing experience better for the users. But, that has been changing for quite some time now. Last year, Android Pie brought native key mapping support for the Sony PlayStation 4’s DualShock 4. Previously, the default keymaps for DualShock controllers were only present in Sony Xperia devices and other devices whose OEMs bothered to include them. The feature was heavily requested over the years, so Google and Sony engineers finally fulfilled our wishes in Android Pie. A new commit (via 9to5Google’s Stephen Hall) in the Android Open Source Project suggests that native DualShock 4 controller support may be getting even better. The commit aims to make Android work with the DualShock 4’s motion controls. If you weren’t already aware, all DualShock 4 controllers have a built-in gyroscope and accelerometer which are sensitive enough to detect tilts, rotations, and other movements of the controller. I can see how helpful it’d be in racing games, where one’s natural reaction is to tilt their body while turning a car in-game. Given that this patch was first submitted in December of 2017, we didn’t want to speculate about if or when it would make its way into Android. However, the commit has been updated numerous times over the past year, with the most recent comment being made on February 8th, 2019. 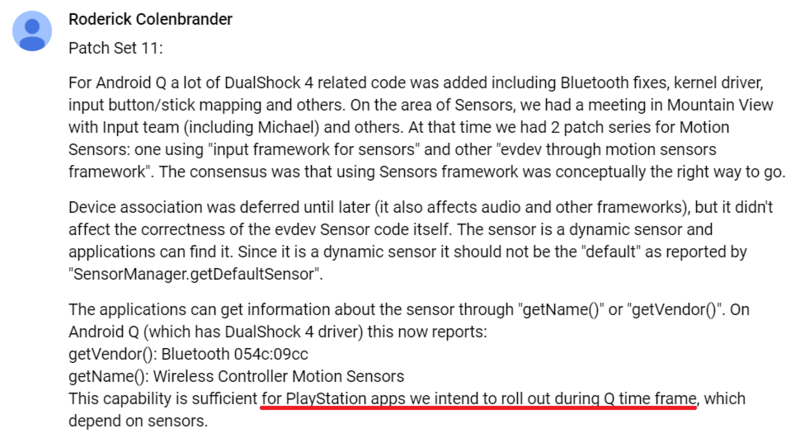 Originally, we thought that Android Q would support the DualShock 4’s motion controls, but an engineer at Google states there are still things to be discussed about implementing this feature. Therefore, the commits won’t be merged as the feature is not approved for Android Q. 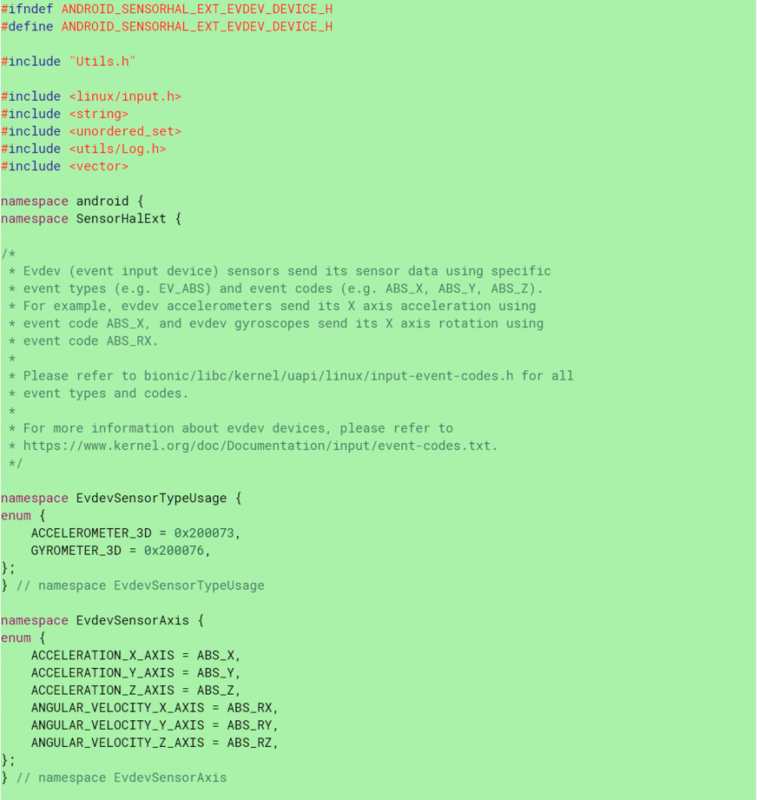 Regarding Android Q, apparently, Sony added a bunch of DualShock 4 related code, including “Bluetooth fixes, kernel driver, input button/stick mapping.” There are also comments about the nature of the sensors inside the controller. Roderick Colenbrander, Director of Hardware and Systems Engineering at PlayStation, explains that because those sensors are dynamic, the system shouldn’t provide their default parameters. Rather, applications can retrieve the required information via ‘getName()’ and ‘getVendor()’ functions. Mr. Colenbrander also discusses possible ways to pass the inputs to the device. There are two possible solutions. 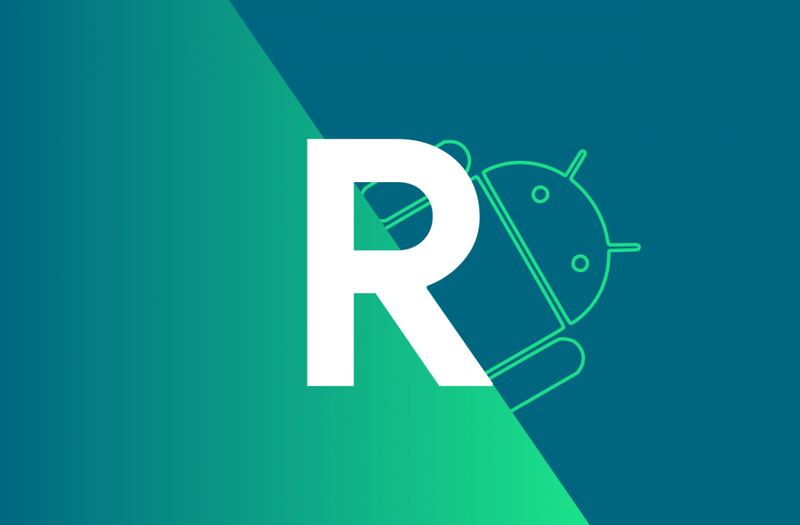 The first one is an official, natively supported Sensor Framework which is already built into the Android. It helps developers acquire raw sensor data with classes and interfaces like ‘SensorEvent’, ‘SensorManager’, and more. These APIs give developers access to a list of sensors, listeners, orientation information, event timestamps, and more. The second way is using evdev (event device), an interface inside the Linux kernel which carries almost the same purpose of reading and writing input events. The engineer says that after a meeting in Mountain View, the team has decided to go with the Sensor Framework, for obvious reasons like first-party support. His comment also mentions PlayStation apps that Sony apparently intends to roll out this year, which we have no information on currently. That’s pretty much everything we can tell you about what Sony and Google are apparently working on. Support of motion controls on DualShock 4 controllers is nice, but I’m more intrigued by the possibility of new PlayStation apps. Considering the engineer’s position within Sony (the development of hardware and software technology for cloud gaming servers and cloud infrastructure), we hope that they will use these platforms for PlayStation game streaming on Android. This is just speculations as there is no official information about new PlayStation apps on Android. We’ll keep you updated if we learn anything new.